This post talks about the pros and cons of streaming your public meetings to Facebook Live. It's part of our series on local government live streaming. In April of 2016, Facebook entered the live streaming world and brought new levels of attention to the online engagement platform that had been growing for years. Within a matter of months, they quickly discovered that users spend 3x more time watching live video than any other form of content. Live streaming is powerful. As a city official, Facebook Live may have you wondering how you can use this platform to engage with your residents more effectively. What if you could stream your city council meetings online? How about community events and other happenings around city hall? If these thoughts have crossed your mind, you’ve tapped into something important. You are visualizing what civic engagement looks like in the digital era. You clearly understand where your residents are spending their time (answer: online) and are on the right track to figuring out how to reach them. Though it’s a powerful tool, streaming exclusively on Facebook Live has its downsides and limitations. Here are some reasons your city council should stream with a more sustainable streaming solution. Facebook Live’s primary limitation is that it only lets you stream content to Facebook. As a platform, there’s no denying that Facebook has a huge reach. But that’s not enough of a reason to only stream there. Not every one of your residents spends a lot of time on Facebook or even has an account. Instead, you should stream to your city’s website. Your website is already home to many resources and tools for your residents. Access to live public meetings should be one of those. Don’t make people leave your website to watch. If you have a problem with a Facebook Live stream, who do you call? Live streaming isn’t difficult, but certain technical issues could definitely interfere with your broadcast. When your municipality is sharing an important event, the last thing you want is to have something go wrong and anger your online viewers.. Having someone to call matters. You need a team on your side that has worked through network issues in all kinds environments and will troubleshoot issues before they occur. The idea of buffering plagues anyone who’s ever watched video. And it always seems to come at the most inopportune moment. When a stream buffers, viewers are left helpless, entirely at the mercy of their device and internet connection. To eliminate buffering, BoxCast shows your broadcasts to viewers at the highest possible quality that works with their networks. Live video is important, but what happens once the event is over? Many city councils want to own their content to keep for their records, especially so that residents can access previous meetings. When you choose to stream, don’t make your viewers search for your video in the deep, dark depths of a Facebook newsfeed. Instead, choose a solution that will automatically keep and preserve meeting videos in a way that can be accessed easily. Security is an issue that’s especially important when it comes to government officials. In this regard, Facebook just doesn’t meet the cut. Facebook takes ownership of your content so that they can monetize it with targeted ads. You need a solution built to help you reach your residents, not advertise to them. At BoxCast, we’ve built a solution to serve you as a city official. With the ability to easily embed your video streams directly on your website, a team of experts ready to help you with any issues that may affect your stream, the ability to minimize buffering for each viewer, automatic archiving, and a desire to help your engagement over all else, we are the complete, easy-to-use live streaming solution for you. Best of all, if you still want to leverage Facebook’s expansive reach, we’ve got you covered. 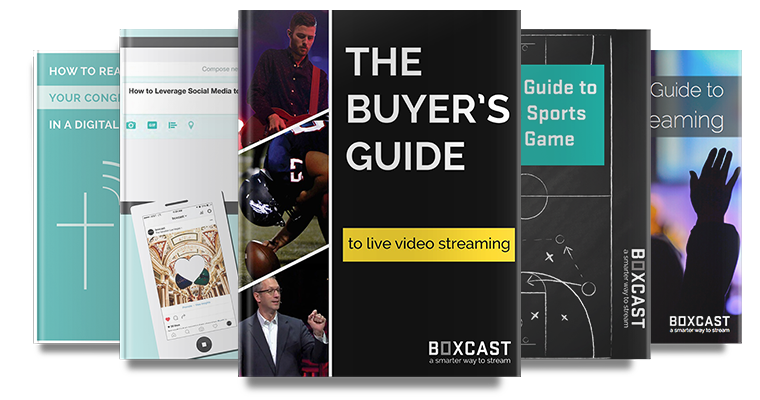 BoxCast’s Facebook Live integration makes it easy to simultaneously stream to your website and Facebook Live at the same time. It’s a great way to maximize your exposure while retaining the benefits of the BoxCast platform. If you like the idea of streaming, but aren’t sure how to go about it, finding the right equipment is a great place to start. This comprehensive guide outlines various streaming trends and showcases the best equipment for live streaming.